The gray code is a binary numeral system where two successive values differ in only one bit. Given a non-negative integer n representing the total number of bits in the code, find the sequence of gray code. 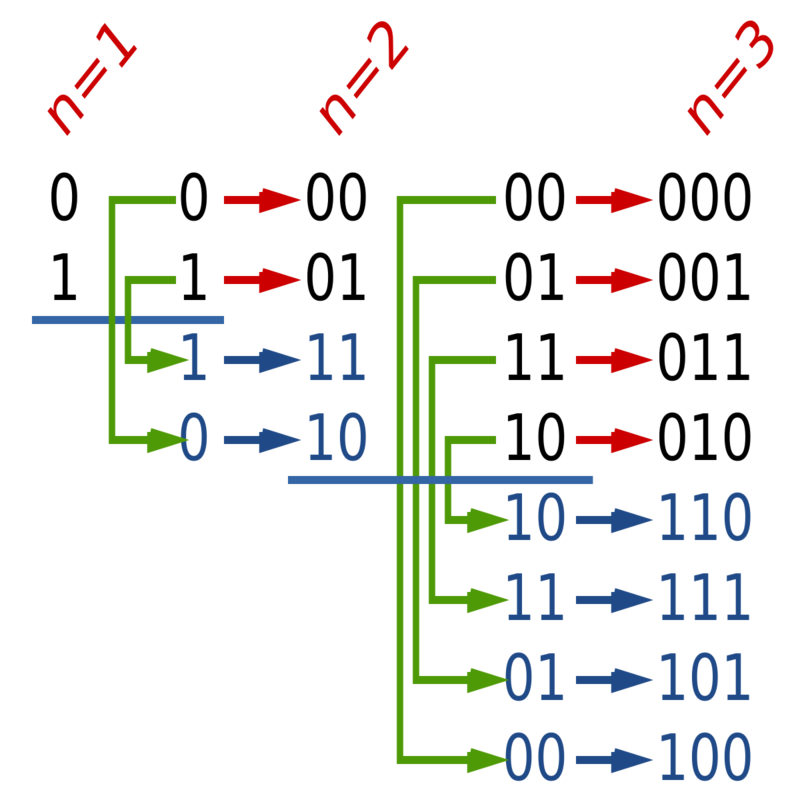 A gray code sequence must begin with 0 and with cover all 2n2^n2​n​​ integers. [0,2,3,1] is also a valid gray code sequence according to the above definition. 从图中我们可以看出n 位的格雷码可由 n-1位的格雷码递推，在最高位前顺序加0，逆序加1即可。实际实现时我们可以省掉在最高位加0的过程，因为其在数值上和前 n-1位格雷码相同。另外一点则是初始化的处理，图中为从1开始，但若从0开始可进一步简化程序。而且根据 格雷码 的定义，n=0时确实应该返回0. 生成n 位的二进制码，时间复杂度 O(2n)O(2^n)O(2​n​​), 使用了msb代表最高位的值便于后续相加，空间复杂度 O(1)O(1)O(1).